Located on a primary thoroughfare in Lincoln Park, this building is designed to fit comfortably into its urban context in its massing and use of materials. Although it is a relatively large building, its facade is designed as a series of smaller components that are visually appropriate in proportion and scale. The brick structure with its masonry detailing and limestone base is reminiscent of many of the surrounding buildings built after the turn of the century. This project involved the localization of cultural buildings in the city center. The primary functions of the buildings are that of a concert hall/theatre, slooping museum, and a library. 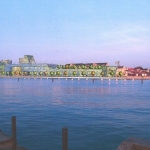 The design solution incorporates a new Culture House, Library, Rhythmic Center and Slooping Museum into a campus surrounding the inner marina. 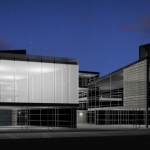 In 2008, this project received a Citation of Merit Award for design from the Chicago Chapter of the American Institute of Architects. Aging well engenders a community that promotes living well. 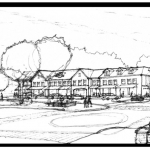 Our design approach to Senior Communities focuses on invigorating all facets of healthy living, providing design solutions that support active lifestyles within all dimensions of wellness including physical, intellectual, social, emotional, and vocational. Residential and social spaces are specifically designed around each area of wellness, addressing the needs of the residents while maintaining a high level of independence in a community setting. 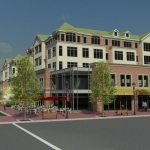 As requested by the Village, this project analyzed the existing building context of downtown Northfield including the Village Hall, Police Station, and Library buildings, and developed a long term vision plan for the Village Center retail district. Guidelines were specifically created to provide potential for a traditional urban downtown district. The work involved close cooperation with the Village Center Task Force, Community Development Director, and the Village Manager. The concept for a new 140,000 sq. 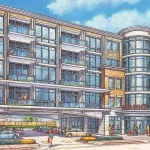 ft. mixed-use building was designed to maximize the size of the surrounding neighborhood. The 30,000 sq. foot ground floor commercial space takes advantage of the street frontage and the adjacency of the covered parking lot for convenience and accessibility. The second, third and fourth floors contain 65 residential condominium units averaging approximately 1,200 sq. ft. per unit. 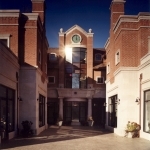 Located in the heart of downtown Winnetka, Winnetka Galleria offers exceptional design, expansive outdoor terrace space, and superior living standards currently unparalleled on the North Shore. Offering the freedom and prestige formerly reserved only for Oak Street and Michigan Avenue, Winnetka Galleria captures the spirit of a “walk to everything” address. This project was honored with the Grand Award for recognition of outstanding design in the Mixed-Use Commercial/Residential category from the National Commercial Builders Council Awards of Excellence. The complex three stage Royal Theatre building majestically provides an architectural transition between water and land, while in the same breath provides a theatrical transition between audience and performer. The arrival procession begins by walking under the glass foyer that bridges the axis of Sankt Annæ Plads and then penetrating the arc that forms the ground level foyer. This space graciously functions as the main foyer for the small “Black Box” Theatre, which ‘floats’ on the water as an island of uninhibited experimentation.